A slap is a physical act not meant to wound, maim nor kill. It is rather, an act born of frustration, of indignation and a stinging rebuke for unwanted action. Ahed Tamimi is a 16-year-old Palestinian girl who lives in the Palestinian village of Nabi Saleh where villagers have resisted the Israeli occupation. The Israeli occupying army functions as the military defenders of Jewish settlers in the nearby Jewish settlements of Halamish. This is a settler village whose residents steal the Nabi Saleh villagers’ water, and illegally confiscate their farm land to expand the settlement. I was introduced to the area in 1977 when Palestinian leaders encouraged a group of foreign journalists with whom I was traveling, to visit an abandoned “Tegart Fort,” one of a series of military installations placed on strategic hills, first by the British during the Mandate period and later used as police outposts by Jordan. The Tegart fort above the village of Nabi Saleh had been empty until Israeli Prime Minister Begin authorized six outposts of Gush Emunim Orthodox Jewish families to move into occupied Palestinian land. Gush Emunim translates from Hebrew to English as “bloc of the faithful”. The fort overlooking Nabi Saleh later became the Jewish Orthodox settlement of Halamish. It was the most recent of the six outposts authorized by Prime Minister Begin. So we decided to drive north to visit with the Gush Emunim Jewish settlers living comfortably and secure on a hill above the village of Nabi Saleh. What we saw was that the IDF had established a tented military outpost within sight of the fort to “protect” the settlers. The obvious plan was for the families to be joined by other Jewish families in a future Jewish settlement (Halamish). I discussed this 1977 visit to the future Halamish in a posting for Wall Writings on April 3, 2010, which I called “Nabi Saleh Has Endured Land Confiscation Since 1977″. In one of the rooms I found an entire family recently arrived from Chicago. The mother had been born in Israel and then moved to Chicago. Now she was back, this time in the West Bank, land she believed was given by God to the Jewish people. On that day in 1977 when we went to the Tegart Fort, we saw Jewish settlers occupying Palestine land by living in an abandoned Jordanian police post. We also saw the IDF standing guard. It was on that day that we saw a carefully planned future for Israel’s invading settlers living under Israeli army protection. That isolated outpost appeared harmless enough to us in 1977. Now, flash forward to this new year of 2018. The IDF continues with its “protection” of Jewish settlements which are anything but “harmless”. The settlements are an established movement through which Israel plans to totally control Palestine. What a small group of foreign journalists failed to grasp in 1977, was a dark future which Palestinians suspected and feared. Israel maintains tight control over the land that Orthodox Jewish mother told me was God’s gift to her family. When Palestinians resist using a religious document as a set of land deeds, they are targeted by the IDF. Nabi Saleh is one of the IDF’s prime targets because its weekly protest marches attract unwanted foreign media and political attention to Israeli crimes against Palestinian citizens. Nabi Saleh is a long-established Palestinian farming village in existence since before the Ottoman era. It is 20 kilometers northwest of Ramallah, the current national Palestinian capital. Ahed Tamimi’s father, Bassem al-Tamimi, and her mother, Nariman Tamimi, are leaders in the Nabi Saleh weekly public acts of resistance. They are under constant surveillance and are frequently arrested. In the youtube video below, filmed in 2015, their daughter Ahed, was 14 and already a fierce resister. It is a short video. It should be viewed and studied as a testimony to the courage of a family refusing to yield to the crime of occupation and a teen-ager who wants to someday become a lawyer who can help her people. Click and view. 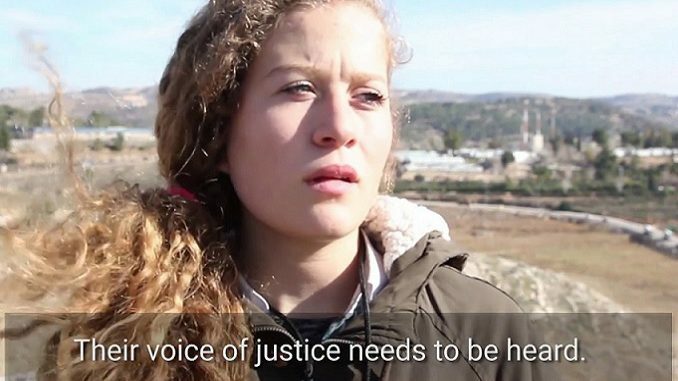 In the final week of 2017, two years after the release of this video, Ahed Tamimi has been arrested by the IDF in a standard Israeli procedure which demonstrates to those who will see and act, just how vicious the IDF can be. Ahed’s West Bank home in Nabi Saleh was entered by a squad of IDF soldiers who broke into the house at four a.m. on Christmas morning. They took her out of her bed, handcuffed her, and pushed her into a waiting paddy wagon which took her away to an Israeli prison. Her “crime”? Two days earlier, two soldiers entered her yard. She and another girl resisted their presence on her private property and pushed them out. In the encounter, Ahed Tamimi slapped one of the soldiers. The soldiers were not aggressive, knowing they were being filmed by Palestinians. They knew they would be back under the cover of darkness to arrest a 16-year-old girl. When U.S. Army General George Patton slapped a soldier lying in a hospital bed in the closing days of World War II, he was expressing disdain for what he saw as cowardice. . The army made him offer a public apology directly to the soldier. Early Monday morning, December 25, Ahed Tamimi was arrested for her slap. Two days later, an Israeli military court extended her incarceration. She is being held without charge, without a lawyer and forbidden contact with her parents. As 2018 begins, Ahed remains in one of the three different jails in which she has been incarcerated. Ahed’s slap should be “heard around the world”. It should be viewed as an act of resistance by a 16-year-old. The world’s media, most especially the U.S. media, is so blind to any thing other than the Israeli narrative. that it refuses to see that Ahed’s slap evokes Ralph Waldo Emerson’s hymn Concord, which begins with words which celebrate an act of defiance by a shot against oppression. Those words are inscribed at the base of The Minute Man statue by Daniel Chester French, which stands at the North Bridge in Concord, Massachusetts. (see above). The Minute Men of our American Revolution began a fight for freedom as a ragtag farmer’s army. Ahed Tamimi is fighting, in her own way, against the brutality and unjust oppressive Israel occupation. – James Wall contributed this article to PalestineChronicle.com. To read more of his articles visit: http://wallwritings.me.